JJC Z-O14-42II Black Auto Lens Cap & Lens Hood Kit is a creative and latest patent product designed by JJC company. It is designed for Olympus M.Zuiko Digital ED 14-42mm f/3.5-5.6 EZ lens and Panasonic Lumix G Vario 12-32mm f/3.5-5.6 ASPH. lens. It contains an auto lens cap and a lens hood. The auto lens cap adopts a screw-in design and can be mounted to the lens front without scratching the lens. The auto lens cap opens and closes automatically as the lens extends or retracts. 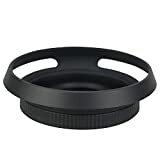 The included lens hood also adopts a screw-in design and helps to block stray light from entering the lens. This kit protects your valuable lens from dust, moisture and scratches. This entry was posted in Discount Photography and tagged 1232mm, 1442mm, ASPH, Auto, Black, Digital, F3.55.6, Hood, lens, Lumix, M.ZUIKO, Olympus, Panasonic, Vario by Ball Photo. Bookmark the permalink.